The Canada Cup is the premier PROFESSIONAL squash event in Canada. 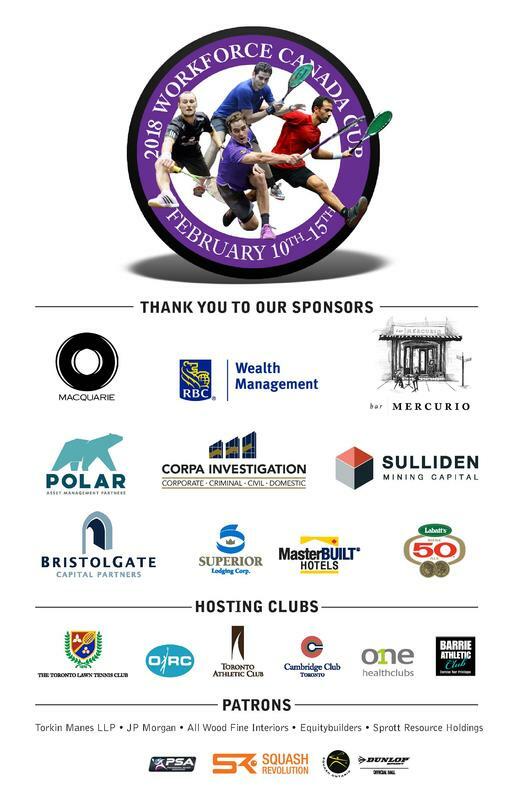 The event is dedicated to creating a high value experience for Squash club members and squash fans across Toronto. Nine years ago, the Canada Cup Committee had a vision to bring the world’s best singles players back to Toronto. In 2009, led by seven time Canadian Champion and event Promoter, Shahier Razik, the best players in the world arrived in Toronto to compete for the title. The event since has attracted an impressive list of the World #1’s including Jonathon Power, Ramy Ashour, Greg Gauliter, Nick Matthews, Mohammed El Shorbagy, and the 4-time world champion Amr Shabana who called it the ‘Tournament of the year!”. The 2018 Canada Cup is set to make its return to Toronto February 10-15. The tournament boasts a rich 8-year tradition of attracting the very best squash players in the world, making it the gold standard for Canadian squash. Bringing in the best year after year has resulted in significant growth for the Canada Cup. Riding the momentum, this year's tournament is a sanctioned PSA $50k world ranking event. The event will feature 28 of the world’s top players in main round and qualifying draws. Situated at various Greater Toronto Area Club’s, Toronto Lawn & Tennis club, Toronto Athletic Club, One Health Club, Ontario Racquet Club, and the main host venue, The Cambridge Club. The qualifying draw for the event will take place at the Barrie Athletic Club, in Barrie ON.